This is a game between two teams who have a genuine European pedigree and of course, the away side has lifted the Eurocup twice. These two teams have played each other twice before, in the 2006/07 Eurocup, and the home team won on both occasions. The Germans will be desperate to keep that run going as they look to strengthen their position in Group B.
ALBA Berlin are currently 2-0 after two games in the current Eurocup season, and they’ll be confident going into this game. This is likely to be one of the toughest challenges they’ll face at home but with Elmedin Kikanovic on form, having grabbed an average of 20 points in the campaign, they should have enough to put the Russian side under pressure at times. There is also the form of Dominique Johnson, who has grabbed an average of 17 points and Dragan Milosavljevic who has picked up an average of 12 points per game this season. The Berlin side definitely has the players to take control of this game. The side from Moscow comes into this game with a 1-1 record after they lost our narrowly last week. One of their key players in the game is likely to be Earl Rowland who has averaged 15 points per game for this campaign. Other players who have made their mark include Jacob Pullen, who has averaged 11 points per game and Sergey Monia, who has provided an average of 14 points and 5 rebounds per game. 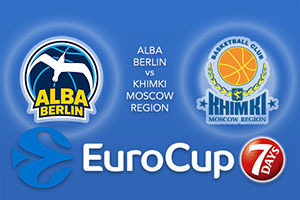 There is no denying that Khimki have the players who can cause any Eurocup opponent problems and we could be in for an exciting match on Wednesday in Berlin. The away side are just favourites for the bookmakers, which is a decent assessment, but this is definitely a game that can go either way. If you’re looking for value, look to take ALBA Berlin at+3.0, which you will find on offer at odds of 1.90. For the Over/Under market, look to go OVER 161.5 which is provided at odds of 1.90. Bet Now!